It's new release time once again over at Whimsie Doodles and this month Melyssa has created two stunning Abby Girl images and a unicorn set. Please pop over to the blog to have a look and to check out what my teamies have created with these images. 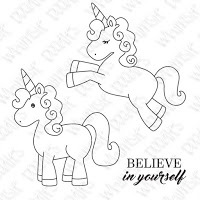 For my inspiration card I just had to play with the unicorns, they are so darn cute! I decided to go with the leaping unicorn and had originally wanted to incorporate a rainbow into my design, because rainbows and unicorns go together - don't they?! However, my rainbow die is tiny and I wasn't feeling creative enough to make my own rainbow and decided just to use my cloud dies instead! Now this card is a bit out of my comfort zone in the sense that it is very girly and very pastel! I tend to go for bright strong colours so this was a change for me, and I'm not sure if I like it! I started by adding some extra lines to the unicorns tail with a copic liner as I wanted to make the tail multicoloured! The image was coloured with copics and fuzzy cut it out. I blended some pastel yellow and blue chalk ink onto some white card and die-cut a rectangle panel out using blueprints 20. I printed the sentiment, die-cut some clouds and mounted them onto the bottom section of my panel. The unicorn was also mounted using foam dots. I die-cut some tiny stars from pink designer paper and white glitter card using a die from ME basic set and randomly added them to the scene. Using SSS fog cardstock I die-cut the large scallop rectangle from blueprints 20. I then adhered my scene to the scallop rectangle before mounting it onto the card base. I added some wink of stella to the clouds and to the unicorns tail and mane. Andrea, this is so soft and sweet and beautiful! This is so pretty!! You really nailed the soft colors, and they are perfect with this image and design :) Thanks for Making Your Mark at ATSM this week!! Wow Andrea.... I'm LOVING what you did with this fabulous unicorn... it really is beautiful and I'm loving those pastel colours! This is such a darling card, Andrea! Beautiful coloring and blending...so soft and lovely! Thanks so much for playing along with us this week at ATSM!